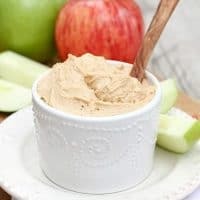 This Creamy Peanut Butter Dip is a definite hit with kids–mine gave it a 10 out of 10. But who am I kidding? I loved it just as much as they did. We like it with bananas, but apples were our favorite. Honestly, I ate a fair amount right out of the bowl with a spoon. My kids decided to try it for breakfast, on toast and waffles. I’m thinking it would also be really good on muffins, bagels and especially pancakes. Low and non-fat yogurt and whipped topping are both fine in this recipe. It keeps well in the refrigerator overnight, and I suspect it would be good for several days, but it never lasts that long around here. 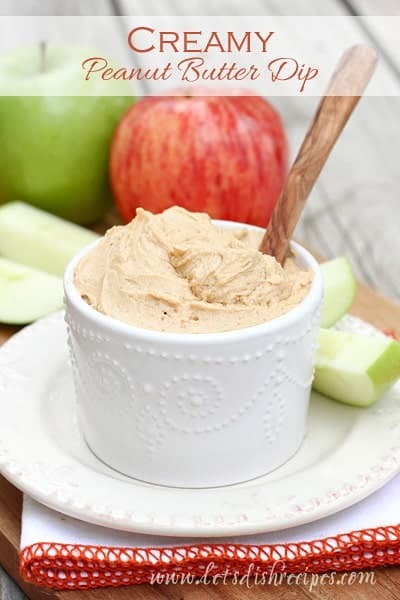 In a medium bowl mix together yogurt and peanut butter until well blended. Stir in cinnamon. Fold in whipped topping. Chill until ready to serve. Serve with fresh fruit. Who Dished It Up First: I found this recipe at New Wife Experiment, where Kat claims she doesn’t have much experience in the kitchen–but all of her recipes look like winners to me. I know this one was. this looks so delicious…i think i would like it with apples too…and maybe pretzel sticks…i like pretzels dipped in anything! I am definitely going to make this to use on some berry yeast bread I just made! Serious YUM.